Happy Cinco de Mayo aka the perfect excuse to drink margaritas day!!!!! After countless weeks of rainy days, particularly on the weekend, its finally decided to just go ahead and get damn hot out here in the middle of the ocean. I will be moving to the beach any day now, as my house is currently approaching intolerable in the afternoon. Especially with the sunburn I acquired today. Did you know that the oil that makes peppers so spicy isn’t water soluble? That means no amount of water, no matter how cold, will quench the fire that these jalapeno poppers are going to cause in your mouth. The oil is only fat or alcohol soluble, so you can either dip your tongue in sour cream, or chug your margarita. Just one more reason why margaritas are better on the rocks. 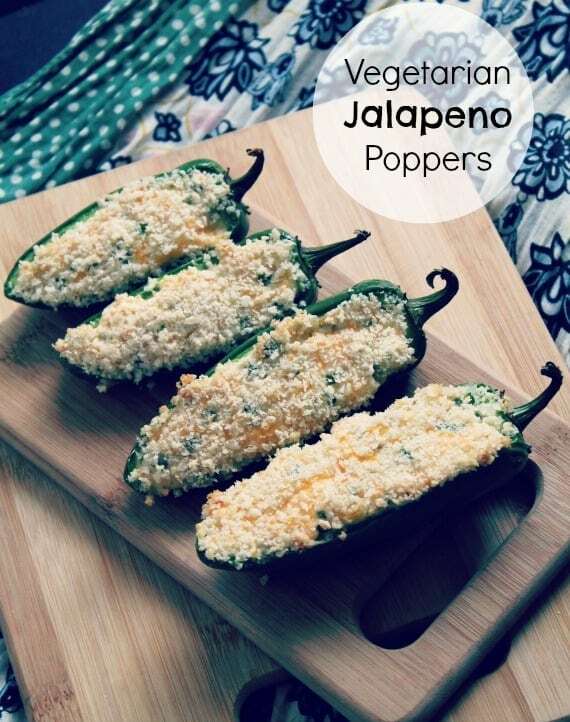 I know we’ve been to jalapeno popper land before, but this version is vegetarian friendly and extra spicy. It’s got minced jalapeno and habanero mixed in to the cream cheese, along with green onion and garlic. The filling is a bit chunky and drippy nose hot. I can’t say you won’t miss the bacon because how could you not, but if you have vegetarians in your life, they’re going to be smiling and chugging their margaritas. Don’t say I never fed you vegetables. Don’t say I never gave you an excuse to drink more margaritas. Don’t say these aren’t awesome. You will be a liar. 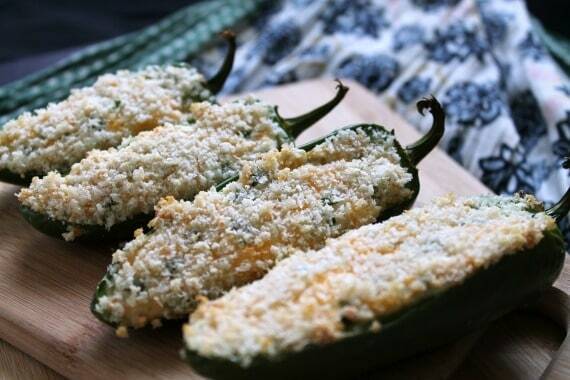 Jalapeno poppers with an extra spicy, chunky filling. Preheat your oven to 425 and line a baking sheet with foil. Slice off the top third of each of your jalapenos, lengthwise, then scoop out the seeds and ribs to make a boat. Line up the jalapeno boats on your baking sheet. Dice up the remaining strips of jalapeno and add them to a large mixing bowl. Add the habanero, green onions, garlic, cream cheese, cumin, shredded cheese, and salt and pepper to your bowl. Combine all these ingredients. I used my stand mixer, but if you want a good arm workout, you could mix it all by hand. Use a small offset spatula or a butter knife to fill your jalapeno boats. Make sure to press it all the way into the crevice for maximum cheese potential. Put your breadcrumbs and parmesan on a small plate and mix gently. 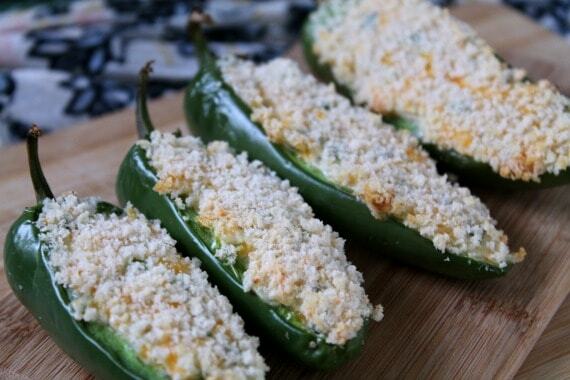 Carefully press the cheesy side of each jalapeno boat into the bread crumbs for a crunchy crust. Bake for about 15 minutes or until they reach the perfectly level of gooey toastiness. Hold off for about 10 minutes then go at it with plenty of fat or alcohol by your side. You'll have lots of filling left over. May I suggest smashing that onto a toasted bagel and topping that whole situation with a fried egg? What could go wrong?